In our continued pursuit of excellence, Solid Axle Industries releases a new line of fixed spindle conversion kits under the name SpynTec. When we set out to design the final word in unit bearing replacement, we first wanted to understand the weaknesses of the original equipment found in your vehicle. Automobile manufacturers have taken away your ability to maintain your 4x4 by moving to the planned obsolesence of the unitized bearing front end. When the OEM bearings fail, you and your truck are literally stranded until you can replace them, or incur the high cost of towing to your local dealer. surfaces. When installed, your ABS system is now completely sealed from the harshest on and off highway environments. All SpynTec kits utilize such names as Timken, SKF, Chicago Rawhide, and Spicer. Whether you rely on your vehicle for work or play, you can’t afford to be sitting still due to an unfortunate bearing failure. Solid Axle industries understands this and has answered with the SpynTec line of unit bearing conversion kits. Check out http://www.spyntec.com for the latest info and pictures. • Forged hub with gear cut ABS tone ring. 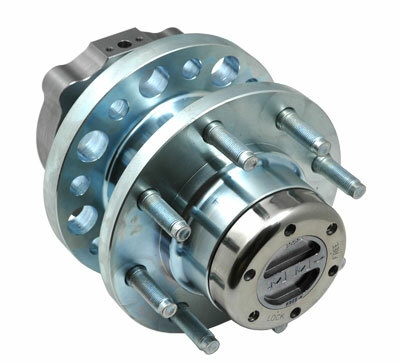 • Forged spindle with integral ABS sensor mount. • Includes all bearings, races, seals, and spindle nuts. • Utilizes premium locking hubs. • As always, SpynTec conversion kits fully seal the ABS sensor and tone ring from contaminates on and off road. • Forged Hubs with Machined Reluctor Ring. Click the button below to add the SpynTec Conversion Kit For Dodge 2012+ Dually to your wish list.